Slim Business Cards is rated 4.0 out of 5 by 2. An easy way to create an unforgettable custom business card. Rated 5 out of 5 by Anonymous from New size Our church is using these as hymnal bookmarks- we love the slim look.Members love them for quick reference when opening. We have one for each hymn. Rated 3 out of 5 by ad agency from Problem with machine cutting cards consistently I like the size of slim business cards, and my design looked good when it was printed, BUT the printing was a little crooked on some of the cards, and I don't know how that happened since I know a machine printed and cut them. Some cards are perfectly aligned, but others are not. The ink printed fine, it was just that the cutting was off. Slim business card printing produces cards that are so sleek, some customers are choosing to go with these 1.75” x 3.5” cards over other size options (standard business cards are 2” x 3.5” and typically either 14 or 16 pt. Thick as well). It’s like having high-quality small business cards; they are compact and are therefore easy to carry around. Your printed slim business cards can be created on thick 14 pt. cardstock but we also offer a 16 pt. cardstock option for those who want their cards extra thick. Having coating options is important as they do have a direct impact on the look and feel of your cards. Our uncoated option helps emphasize the design itself while our aqueous coating options give your cards extra pizzazz. Matte aqueous coating leaves a dull, muted finish, while gloss aqueous coating gives you just a little more. If you need your cards to be really shiny, choose our high gloss UV coating option. If you want your cards to be even more unique, try adding rounded corners to your design. 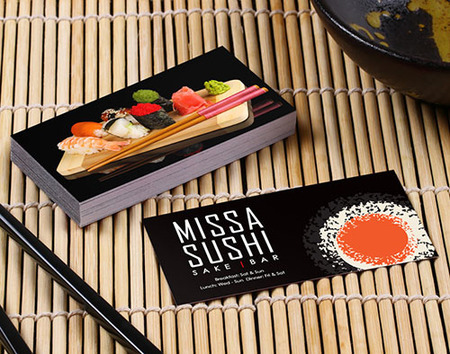 Our slim business card printing services allow for same-day printing (provided you meet our cut off time). For more custom features, give us a call at 877-405-3949, M-F (7am-8pm CT) or create a custom order. To make designing and printing your business card online easier, PrintPlace.com offers layout templates. These templates provide you with the right specifications to ensure your design is printed correctly. Download one of the formats below to start. Just because they’re small does not mean slim business cards are any less effective compared to standard-sized ones. It’s all about the design and knowing what information to add and what to leave out. If you have a gym or a yoga studio (or other business focusing on health and fitness), for example, you could add a photo of your establishment on the back and add your logo and contact information in the front. Leave out other details that can be found through your website or other marketing materials. These mini business cards are also just plain cute. They won’t look overly formal when handed out. That makes them ideal for people who intend to use them as conversation pieces when introducing themselves to prospective customers.